Fresh off setting a PIAA record in the 50-yard freestyle swim in March, State High’s Matthew Brownstead followed up with a national 50-yard freestyle championship at the 2019 Short Course YMCA Nationals in North Carolina. GREENSBORO, N.C. — Fifteen Centre County swimmers tested themselves against some of the nation's best this past week, representing the State College Family YMCA at the 2019 Short Course YMCA Nationals in Greensboro, N.C. Among the competitors were State College High School standouts Matthew Brownstead, Noah Witt, Colleen Adams and Grace Dangelo. "The kids had fun," coach David Rue said. "It was a once in a lifetime experience." Brownstead, coming off a March where he set the PIAA record in the 50-yard freestyle, continued to add to his accomplishments in the event. 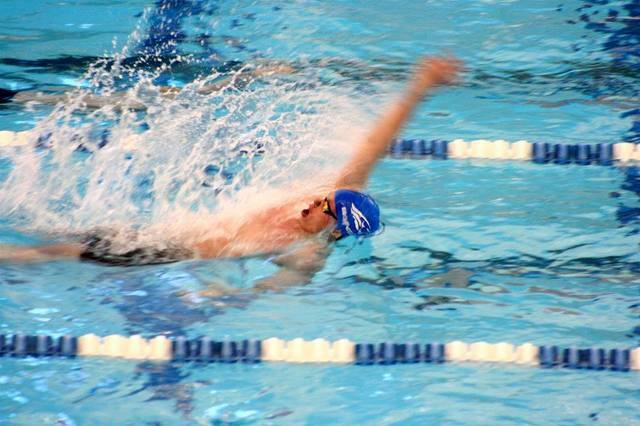 The junior won the national 50-yard freestyle, taking the race with a time of 19.68 seconds. The victory was the first national event title in State College Family YMCA program history. The momentous milestone was the finale of an amazing year in the pool for the team, breaking 19 club records along the way. Out of the 15 who qualified for nationals, 10 were new additions, making their mark throughout the season. "It was a huge step forward for us," Rue said. In the final men's team standings, the club finished 18th, putting up 77 points across the five days of competition. Somerset Hills YMCA in New Jersey became men's team champions while Sarasota Family YMCA out of Florida took home the women's trophy. Competing in nationals was the final journey of a team that included high schoolers from State College, Penns Valley, Bellefonte and Huntingdon. Taking part in the event was a reward for the students' delicate balancing act, having to concentrate on schoolwork, the YMCA program as well as their own high school swimming exploits. "It takes sacrifices to be at the level that these kids are at," Rue said. "I'm proud of them for being able to make that commitment. Early mornings, practices in the afternoon or evenings, it's a lot to juggle, but they all do it really well." Rue believes the YMCA program is a chance to mature the athletes as not just swimmers, but as young men and women. "When you get to this level, you like to let the kids be the captain of their ship ... they're steering the ship, they're driving the car and whenever they need to be pointed in the right direction, I'm there to help them," he said. A large part of the program's appeal is the camaraderie between teammates, coaches and family members. After getting off the road and into Greensboro, the swimmers stayed in a house with themselves and their parents, making for a unique bonding event. "Part of our name is the State College Family YMCA, and I really think this team is a family ... being able to share the same rooms and everything, having meals together, driving to the pool together, I think it adds to the experience," Rue said. After a successful 2018-19 campaign, the club is confident that the successful nationals experience is only the beginning of a positive trend. "I really think we're a team that's been on the rise," Rue said. "I think this was the best season in the history of the program, and I think we can use this meet as a springboard to even better things."